Each robotic unit reportedly contains an internal incinerator compartment capable of destroying almost any form of evidence that could implicate it in abuse. HOUSTON—In an effort to enhance the agency’s capabilities while reducing the burden on its existing force, sources confirmed Friday that the Houston Police Department has developed a new line of law enforcement robots capable of wielding the excessive force of five human officers. 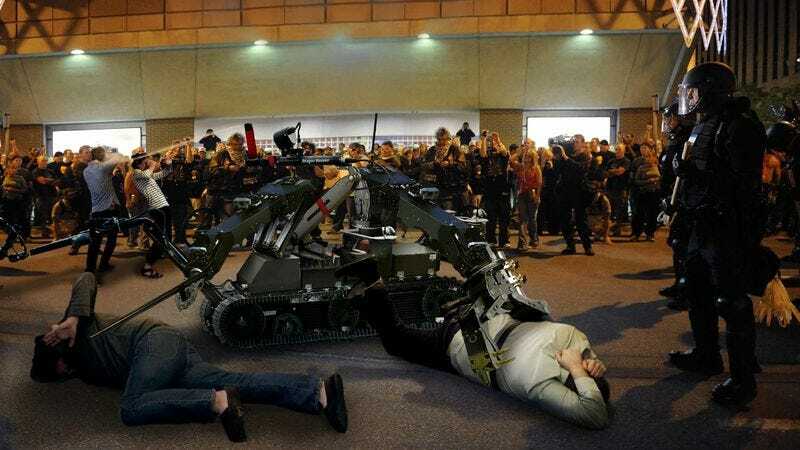 First dispatched by the HPD earlier this month, the tactical robotic units, known as the AP-12, are reportedly equipped with on-board mechanisms to target both criminals and innocent bystanders, and possess a variety of retractable instruments that allow them to effortlessly subdue and restrain up to four individuals at once. According to sources, just a dozen of the new robots will be able to collectively carry out the physical and psychological abuse typically spread out amongst the officers of an entire precinct. “In many ways, these robots’ actions are indistinguishable from those of our brave men and women in uniform,” McClintock added. According to its designers, the AP-12 is outfitted with numerous features that make it ideal for abruptly resorting to extreme measures, including a highly sensitive motion detector that perceives most gestures as an act of resistance necessitating physical force. Additionally, the robots possess a powerful hydraulic grasping system, enabling them to repeatedly slam subjects of any size and weight against fences, dumpsters, and car hoods with previously unattainable levels of aggression. Engineers say the robot is also equipped with a sophisticated audio command program that recognizes and subsequently ignores such phrases as “Stop” and “I give up” and is programmed to apply pressure to a prostrate suspect’s neck with a force of up to 500 PSI both before and after he’s stopped moving. Its operating system is also reportedly loaded with advanced visual recognition software that allows the robot to identify nearly any object in the subject’s hand as a weapon, prompting it to rapidly empty the clip on its extendable .40-caliber firearm. After doing so, the machine is configured to automatically place a pistol on or near the disabled suspect while wirelessly corroborating fabricated details of the confrontation with any other on-scene units well ahead of a potential internal affairs investigation. Sources say the AP-12 represents a vast improvement over previous incarnations of the law enforcement robot, pointing to the inherent deficiencies in such models as the AP-5, released in 1999, which was disastrously unable to distinguish between whites and non-whites. The current version reportedly improves on the functionality of the AP-11, which suffered from a software glitch that led the robot to read arrestees their Miranda rights and allowed them to contact an attorney before being interrogated. “I’m confident that members of the community won’t notice any difference in police quality and performance as these new robotic units begin patrolling our streets,” he added.